On arrival in Perth, you will need to use public transport at least for the first few days. The public transport system is very good and some people choose to use it for their commute to work especially if they work in the city centre. Taxi or Shuttle? Friends or family? When you arrive at the airport your best bet will be to use a taxi service to get to your hotel or other accommodation. You will be tired, overwhelmed and likely have a large number of bags. You can also book a car service if you need a large vehicle to carry your family and personal belongings. A taxi will cost you between AUD$38 and AUD$75 depending on the distance from the airport. If you are on a tight budget and you don’t have a large amount of luggage to carry you can get the Perth Airport Connect Service for around AUD$15 per person to the CBD. The bus system in Perth is excellent and if you live close to a bus station this can be a very easy and cheap way to commute to work. You can buy a bus pass at a Newsagent, at a bus terminal or on board. There are free buses running throughout the CBD, called CAT buses, so you may even get a free trip to work or school. Buses are a great way to see the city if you are keen to explore on your arrival in Perth. 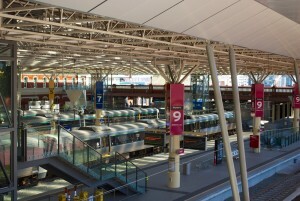 A popular commuter option is using the high speed, air conditioned trains that run daily from a number of the outer areas such as Fremantle to the CBD stopping at all the main suburbs along the way. All stations have large and safe parking areas. The trains run from 5:40am to 11:30pm on weekdays and have a limited service on weekends. There are a few ferries in Perth operating between 6:30am and 7:45pm on a daily basis. If you live near one of the ferry terminals this is one of the most picturesque ways available in the world of getting to work. They are also great for seeing the sights of Perth such as the Perth Zoo which is easily accessible from the Mends Street Jetty. Tickets are available from machines at the Jetties. For timetables, pricing and extensive information check out Transperth the government public transport provider.